Box, thou art clos’d – and Snuff is but a name! It is decreed – my nose shall feast no more! The precious pulvil from Hibernia’s shore! Or may the swallowing earth-quake gulf thy fields! Or bankruptcy be all the fruit it yields! The stanzas above are the first two of twelve of James Beresford’s ‘Elegy’ which was published in 1807 in The Miseries of Human Life (online here). As we saw in a previous post, the firm of Fribourg & Treyer added a small sentence to one of their advertisements, “To prevent mistakes, they find themselves under the necessity of giving this public notice, that they have no concern whatever with any other shop in London”. 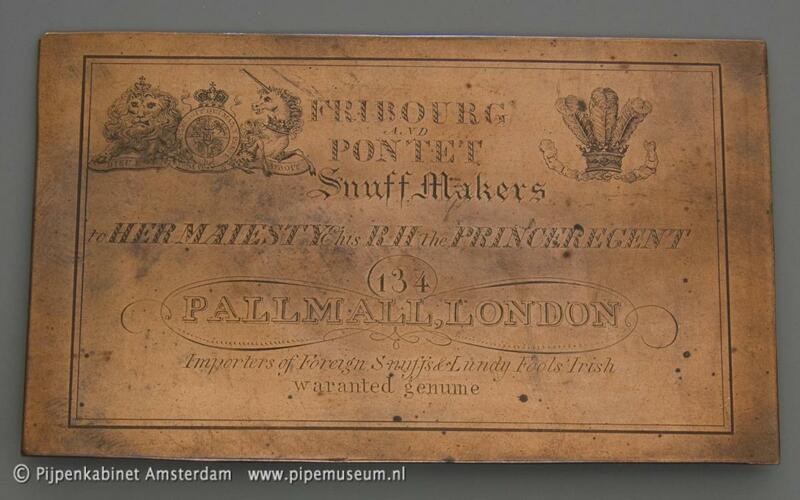 They seemed to be referring to their competitors at 134 (later 124) Pall Mall, Fribourg & Pontet. 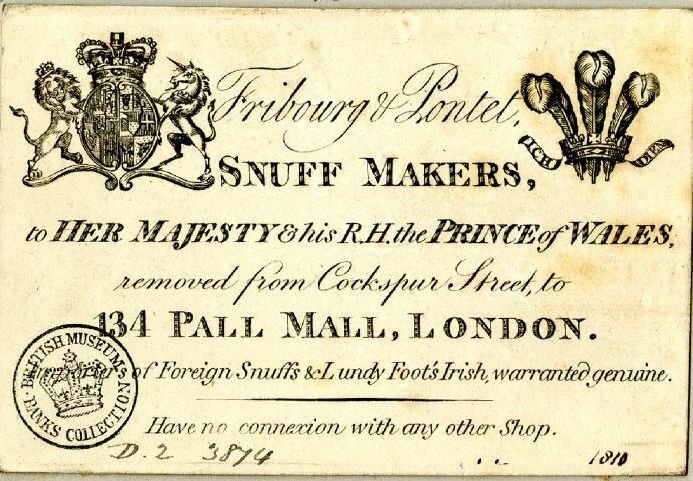 The feeling was apparently mutual as Fribourg & Pontet (Tallis calls him Puntet, but that is a mistake) added a sentence to their trade card, “no connection with any other shop”. Frederick William Fairholt in his Tobacco: its history and associations: including an account of the plant and its manufacture; with its modes of use in all ages and countries of 1859 says that a bill of 1768 is headed “John Saullé and Pontet, successors to the late James Fribourg”, but the British Museum has one of 1774 headed “Fribourg & Saulle” with “& Pontet” added in handwriting, which seems to suggest a later take-over. Please note that the signature is for one C. Pontet, which is Claude Pontet. 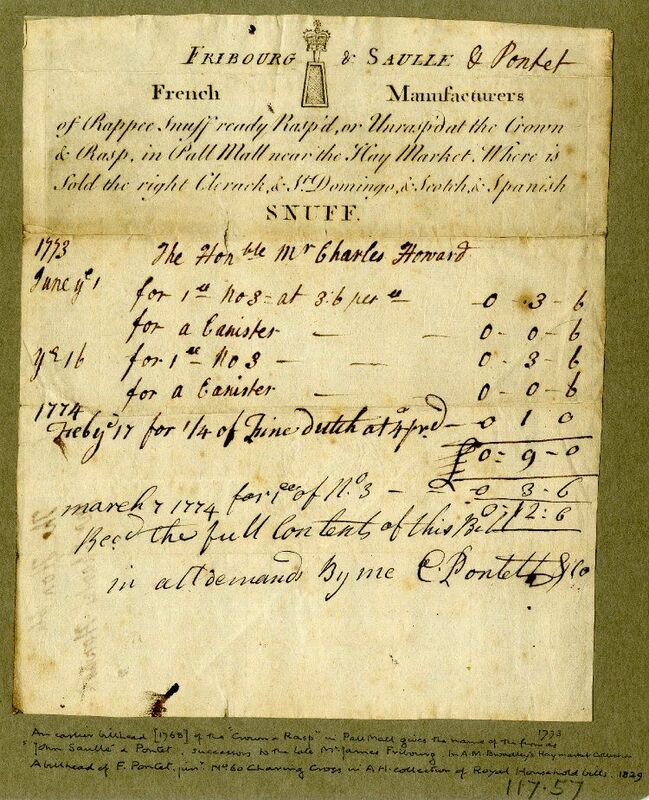 James Fribourg is mentioned in the Westminster ratebooks for St. James Piccadilly in the 1740s, but in the 1760s, the rates were paid by John Saulle. 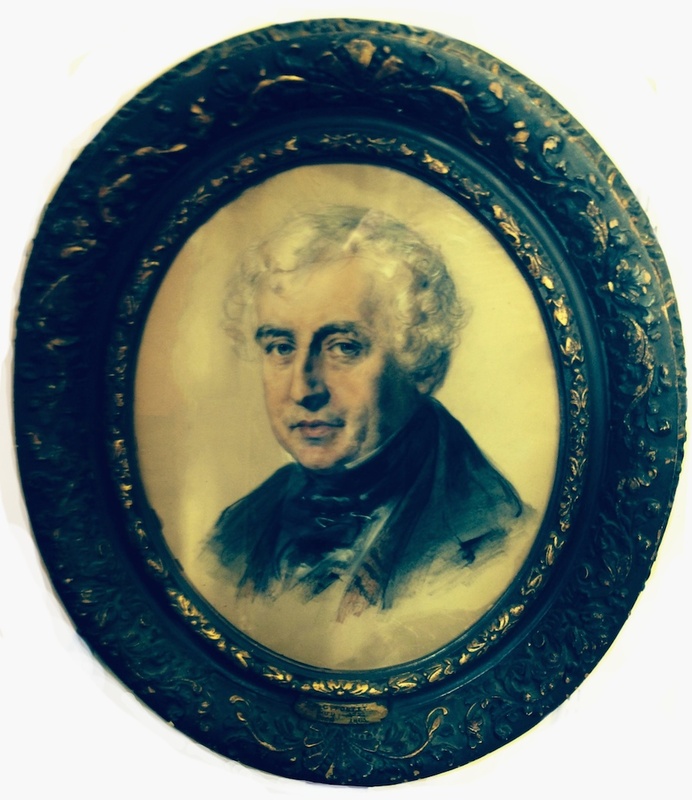 Claude Pontet had married Anne Hill at St. George’s, Hanover Square and their son Franciscus Josephus Maria was born on 24 February 1768 and baptised a week later at the Roman Catholic Church in Lincolns Inn Fields (Sardinian Chapel). Claude died in December 1800, and the business in Pall Mall was continued by his son Francis. We will call him Francis sr. from now on as his son Francis Claude also entered the snuff business. Francis sr. died in 1842, 74 years old. It is said that he had married the daughter of James Fribourg, but I have found no evidence for that. In his will, drawn up in 1824, he names his wife Mary as his executor. He had married Mary Toussaint in 1791 at St. James’s, Piccadilly. (1) Another suggestion is that it was Claude who married Fribourg’s daughter, but here we run into a similar problem; the only marriage I found for Claude is the 1757 one with Ann Hill. 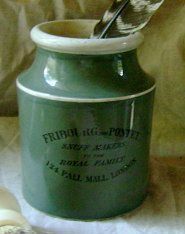 The Fribourg that preceded Treyer was Peter Fribourg, but the one whose name was linked to Pontet’s was James Fribourg. Whether Peter and James Fribourg were related remains unclear, although it does seem likely as Fribourg was not a very common name in London. According to John Arlott they were father and son, but he gives nor references or sources, so I have no idea whether that is true. (2) Arlott has James Fribourg working from the Haymarket before he moved to Pall Mall in ±1738, while Peter Fribourg took over the shop at 34 Haymarket. Arlott also says that James Fribourg moved to Pall Mall with his daughter and her French immigrant husband Pontet, but that cannot be Claude or Francis as they had either not been born yet or were not old enough. Was there an earlier generation of Pontets who married into the Fribourg family, but then why would Fribourg have a partnership with Saulle while the Pontet name was only added in the 1770s after Fribourg’s death? More questions than answers here I am afraid. Over the years, the address for Fribourg and Pontet changed a number of times, and Francis junior had a different address altogether, so below an attempt to make sense of the various moves. The dates are just those that I could find in various resources and for the 1818 and 1819 entries, I do not know whether Francis sr. or jr. is meant. The list makes no pretence at completeness. (1) They were married by licence from the Archbishop of Canterbury on 8 September 1791. Witnesses: James Toussaint and Claude Pontet. Many thanks to Kathryn (@kaffgregory) for sending me the information. (2) John Arlott, The Snuff Shop (1974). (3) The Correspondence of James Peter Coghlan (1731-1800), ed. F. Blom et al. (2007), p. 336. (4) The Standard, 1 June 1878. (5) England & Wales, National Probate Calendar (Index of Wills and Administrations), 1863. (6) Master’s Certificates, National Maritime Museum, Greenwich, number 23.170 (1860, 2nd mate). (7) England & Wales, National Probate Calendar (Index of Wills and Administrations), 1880. (8) England & Wales, National Probate Calendar (Index of Wills and Administrations), 1860. (9) Advertisement in T.G. Austin, The Straw Plaitting and Straw Hat and Bonnet Trade (1871). You may also like to read the post on Fribourg & Treyer, tobacconists, or Georgian Gentleman’s blog post on snuff here. Thank you for your kind comment. And how nice to learn from Crompton’s will that he was involved with Pontet’s and Colnaghi’s premises. 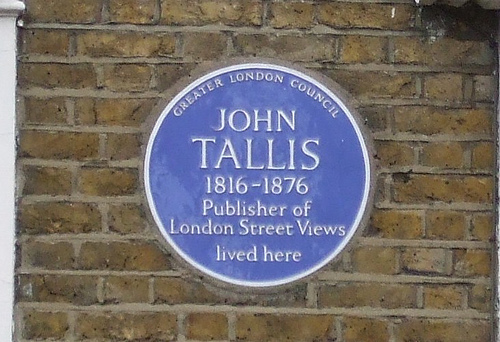 Tallis has Colnaghi at 23 Cockspur Street and Pontet at one point used 24 Cockspur Street, although apparently a lot longer than I thought as 1812 overlaps with his occupation of 134 Pall Mall. It is of course possible that he temporarily had two shops. Or was the will written a lot earlier than the death of Mr. Crompton and never amended to a new situation?